There’s something awe-inspiring about the Warhammer 40k universe and, despite Games Workshop’s utter inability (or desire) to make a clean, fully-functioning ruleset, I keep finding myself falling back into one of my oldest hobbies, Warhammer 40k. Between the rich, detailed history, well-crafted atmosphere & setting, and amazing models, I can’t stay away. Most recently, this has manifested itself as a desire to play a Space Marine bike army, as I have always enjoyed playing fast, maneuverable armies. With the new Space Marine codex, bikers — and White Scar bikers in particular — have grown significantly in their competitiveness (and likewise, their popularity). Despite the issues found in the ruleset, I am a competitive gamer, so in this article I seek to identify the best Space Marine biker weapon. Critically, Space Marines have gained access to a new weapon – the Grav-gun. It has a strange set of rules, ignoring the typical rules for damaging vehicles and ignoring the Toughness(T) of infantry targets entirely, instead using their Armor Save(AS) to determine what number is needed to Wound. Normally, this weapon isn’t particularly interesting to most Space Marine units, as at best it lacks significant range (18”) and requires that the firing model not move if it wants to fire that far in the first place, neither of which are really manageable in the current meta of Warhammer 40k. For those of you unaware, that current meta to which I refer is “be shooty and fast enough to run away from anything that can punch my face in”. And that, of course, is where bikes comes in, like the metaphoric (literal?) cavalry to save the day. Critically, they provide a Relentless platform for the Grav-gun, always allowing it to shoot at 18”, and regardless of movement. With the bike’s move of 12”, this gives the Grav-gun an effective threat range of 30”, as well as the ability to draw unexpected Line of Sight as the bikes swerve around Line of Sight blocking terrain. So, now the Grav-gun is a viable option. But is it the best? 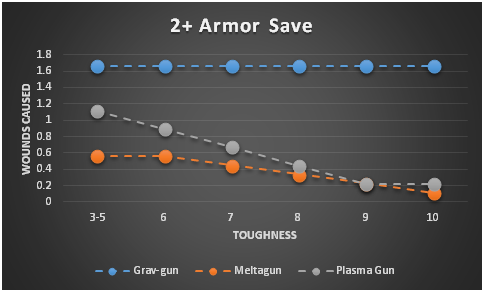 Without further ado, here are the charts comparing the damage output of the Grav-gun, Meltagun, and Plasma Gun. I do leave out the Flamer, as it fundamentally changes the role of the unit to a much more aggressive stance (as Flamers are generally more suited to units that want to punch the enemy in the face) and its number of wounds is difficult to predict. Now, of course, those charts don’t tell the whole story, but they’re a good starting point. Yes, yes, I realize that analyzing any further is probably trying your patience against the urge to go “Purge in the name of the Emperor!” but hear me out. First, the bad news for the Grav-gun. They’re obviously worse than the Plasma Gun on Armor Saves 4+ and the Meltagun on Armor Saves 6+, although not significantly in those cases. 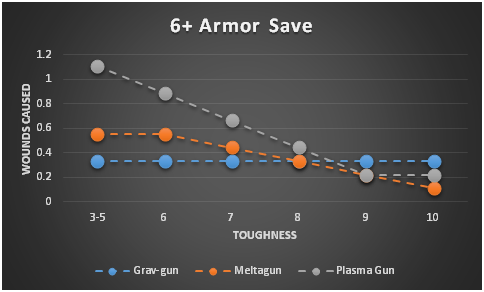 Also, as you get into the higher Toughness values (7-10), the Grav-gun even catches and surpasses both weapons. However, Toughness values that high are quite rare, usually only seen in Tyranid lists or on some Psykers. And while I clumped together Toughness 3-5 models into one data point, they actually constitute the majority of the models you will try to brutally murder in the name of humanity. However, the Grav-gun has several advantages, particularly when mounted on a Bike platform. 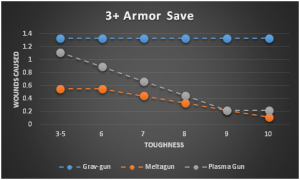 First, it has range over the others – both the Meltagun and Plasma Gun are stuck firing at a 12” range, versus the Grav-gun’s 18”. This is rather critical, as the average assault range is 13” with a max of 18” for an Infantry unit… and I’m sure you can see the problem with the 12” range now. 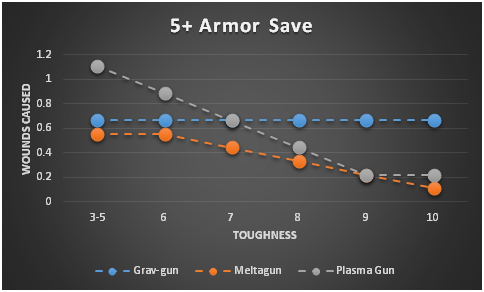 Yes, technically the Plasma Gun can fire at 24”, but at the expense of half of its firepower, meaning it is then outperformed by the Grav-gun against all targets except T3-6 models with a 6+. But even saying that is deceptive, because in this case the model is on a Space Marine bike, which provides a Twin-Linked(TL) Boltgun, capable of either similar or better performance against models in that range. Further, unlike the Plasma Gun, the Grav-gun does not suffer from the Gets Hot! special rule. While this may seem trivial with 3+ AS, on average, it only takes 18 shots to lose a friendly model (and an expensive one at that). 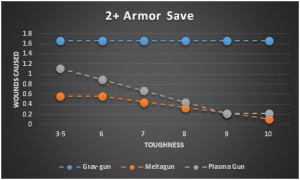 Considering each model fires two shots, and each squad has two such models, over the course of the game this negative special rule adds up. Additionally, the Grav-gun can harm targets that the Plasma Gun cannot, such as AV 14. Going into vehicles is another entire article, however, all three have relatively obvious and well-established niches. So, admittedly, the Plasma Gun does still have a niche, which is killing weakly-armored high T creatures within 12” and busting very light vehicles. The Meltagun also has a niche, and probably a more important/common one, which is busting very heavy vehicles with lots of hull points. There are a few situations where other weapons are more appropriate than the Grav-gun for a Space Marine Biker. However, in most scenarios, the Grav-gun will outperform both the Plasma Gun and Meltagun, and more importantly, is able to do so at a significantly farther range, which is why it is considered the best Space Marine Biker weapon. This entry was posted in Board Game, Strategy and tagged 40k, Army Building, Bikes, Warhammer 40k. Bookmark the permalink.